At the turn of the last century, as industry was booming across the United States, lawmakers realized something had to be done to protect workers who were injured on the job. Factory machines could be very dangerous, and on-the-job safety was often not a priority of employers. One by one, states passed Workers’ Compensation laws to protect injured workers and the families from enormous medical bills, lost wages and other damages. New Jersey passed the Workers’ Compensation Act in 1911. No matter what you do for a living, it’s possible for you to be hurt in the performance of your duties. Whether you, your employer or a co-worker caused the injuries, Workers’ Compensation is available to take care of you. Again, even though the worker could be completely at fault for the injury, you are still protected. Your employer carries insurance just for this purpose. Your employer should file a Workers’ Compensation claim immediately to cover your medical bills, lost wages, other lost income, pain and suffering, and any damage to your quality of life. Workers’ Compensation also covers disability costs if you are unable to return to work due to your injuries. Furthermore, Workers’ Compensation takes care of your family if your work-related injuries are fatal. Even if the employer or insurance company opens a claim, YOU or YOUR ATTORNEY must file a petition for permanency, to obtain compensation for you, in addition to medical and lost wage benefits. To learn more about Workers’ Compensation, visit http://lwd.dol.state.nj.us/labor/wc/wc_index.html. If navigating the complexities of the Workers’ Compensation procedures seems daunting to you, you can turn immediately to civil attorney Douglas Standriff, who is always available to answer your questions and advocate for you and your family should the need arise. If your employer doesn’t file your Workers’ Compensation claim in a timely manner, you or your attorney must do it. You’ll want a qualified civil attorney like Douglas Standriff to guide you and assist you through this paperwork, to make sure you get the compensation you deserve for your work-related injuries, and again, a petition for permanency is the only way to obtain compensation for you. 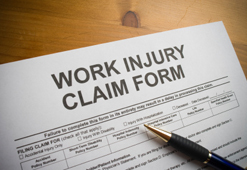 Usually, Workers’ Compensation court handles all claims resulting from work-related injuries. However, if someone from outside your place of employment – "a third party" – causes your injuries, you may also be able to file in Superior Court for a third-party recovery. You need a qualified civil attorney like Douglas Standriff to advise and assist you if you believe you have a third-party claim. If your Workers’ Compensation claim doesn’t move along swiftly and smoothly, call Douglas Standriff at 201-445-4555 before your bills really start to mount up. All Northern New Jersey families are entitled to fair compensation for work-related injuries under New Jersey law, and you need an experienced civil attorney like Douglas Standriff to fight for your rights.